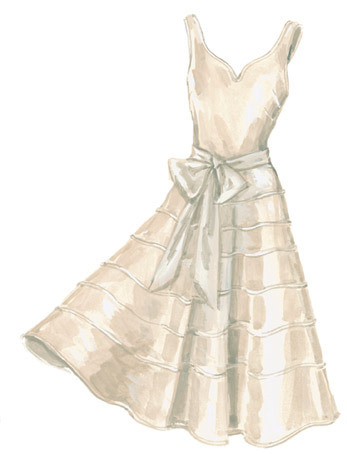 I haven't posted a vintage wedding post in a while, so I thought I'd make it up to you by posting about this lovely Sweetheart Corded Dress by J. Peterman. It is on clearance right now for $148 and they have all sizes available as of today, up to an 18 (43" bust- 35" waist). Isn't it adorable? Pair it with a cute bolero and it would work any time of the year! Labels: 50s Rockabilly, fashion, Vintage Wedding, What's on Sale? 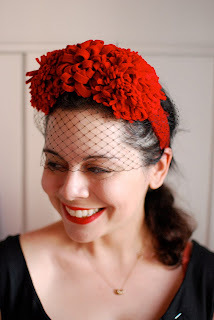 I just LOVE this adorable pom pom hat featured on Grosgrain! The tutorial is easy to follow and very visual. I am thinking that there are so many other materials one could use for this. Perhaps tulle or chiffon for a more elegant feel? Or maybe recycled sweaters? The absolutely charming Brittany at Va-Voom Vintage just posted a very thorough and informative blog post about washing vintage, including a breakdown by fabric. Do yourself a favor and visit the post here!